Traveloscopy Travelblog: Struth! Ready Teddy Go! Struth! Ready Teddy Go! IN his continuing search for the more weird, wacky and wondrous in the world of travel, David Ellis says that growing in popularity in the United States is Take Your Teddy Bear to Work Day – celebrated annually by lovers of these cute and cuddly little companions on October 11th. Devotees dress their Teddy Bears to the nines, take them to lunch with colleagues who've also taken Teddy to work for the day, and where possible even organise special projects that Teddy can take part in. 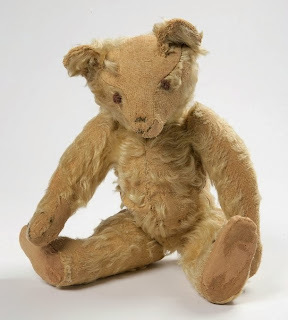 Teddy Bears, by the way, came about after US President Theodore Roosevelt, who was nick-named Teddy, was on a bear-hunting trip in Mississippi in 1902. He was the only member of the group not to track and shoot a bear, so another member clubbed a small black bear and tied it to a tree – inviting Roosevelt to shoot it. The President refused, saying it was unsportsmanlike, and asking another hunter to put the animal out of its misery. The incident was made into a political cartoon in The Washington Post that won Roosevelt considerable praise for his humanity, with cartoonist Clifford Berryman following-up with cartoons showing a smaller and cuter bear. New York candy store owners Morris and Rose Michtom saw one of the cartoons, and made a similar-looking small stuffed bear that they put in their Brooklyn shop window with a sign reading "Teddy's bear." To their surprise a dozen passers-by asked to buy the little "Teddy's bear" in just one day, so the Michtoms made them one each, and the rest as they say, is history.